On the MWC 2017 , Ford presented some concepts, which are mainly concerned with transport in urban regions. The city's gadgets developed the company's employees for the company's "Last Mile Mobility Challenge" (mobility on the last meters). Ford's focus was on handy, environmentally friendly design. 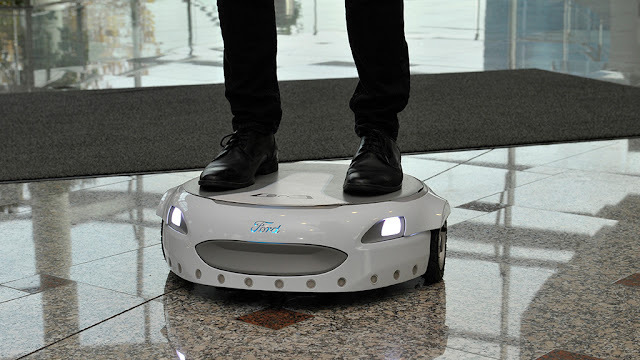 The compact Carr-E platform is a means of transport that should be accommodated in the trunk. The last few meters from the car to the workplace should facilitate the gadget. In addition to transporting people, it should be able to move loads. Whether heavy suitcases or unwieldy parcels, you simply place the luggage on Carr-E and control the device by app. Also concepts for charging stations of the gadget showed Ford - a bit reminds the design of PEZ donors. The Tricity tricycle is handcart, eBike and stroller in one. Tricity looks like a traditional handcart. Similar to a folding wheel, the vehicle can be unfolded - in three variants. Thus, from the handcart a bicycle or a rack, the user is pushed ahead. This is where you put your shopping basket, travel luggage or a baby seat. An electric motor drives the bike and facilitates the pushing and pulling of the tricity. The tricycle is also connected by the way: Among other things, there is a route planner and a payment system on board. Another gadget concept from Ford is Autolivery. This is a small autonomous drone, which is supposed to deliver deliveries in urban areas. The idea is not new - with flying delivery drones, the shipping giant Amazon has been experimenting for some time.